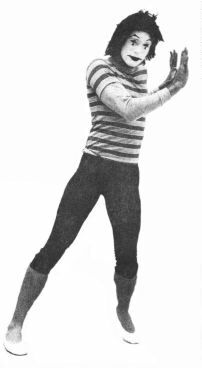 Billy Krahl entered the world of mime at the age of 15 years old, studying from one of the America's best stage mimes, Jewel Walker. Jewel Walker studied with �tienne Decroux, undisputably considered to be the father of modern mime. In the 1920's, Decroux developed his system of pure mime, the " ABC of mime ." He made a great case of exactitude and clarity in form; with the techniques of exact suggestive reactions and imagination, one "sees" an object that is not actually there. Jewel Walker stressed perfection of techniques with Billy, who was trained under Walker's wings for about three years, and it has stuck on him throughout his mime career. In 1978, he entered the inaugural Community Arts Festival in Fort Lauderdale, FL and won first prize. He immediately turned professional and regularly opened the Little Palm Children Theatre (LPCT) at Royal Palm Dinner Theatre in Boca Raton, Florida with a 20 minute solo mime show. Five months later, he was cast as KIKO, a mime-cheerleader and prop man integrated in the audience-participated play of the Hans Christian Anderson's Hansel and Gretel . Due to the success of the show, the play was extended six more weeks and then, again was extended another six weeks. With the permission of the LPCT director, Dr. William Peterson, he adopted KIKO as his stage name. In the Fall of 1979, he went to London, England to study a different kind of mime: organic expressive mime at the Adam Darius Mime School, thanks to Gore Foundation Grant. Kiko traveled all over Florida, performing mime for elementary and high schools, University of Miami, Florida State University (five curtain calls), University of Florida, Florida Atlantic University, Florida International University, Broward Community College, churches, conventions, libraries, retirement communities and night clubs (yes, even winning a couple of the Gong Shows which were a popular fad during the late 1970's; and also was requested frequently to perform mime at gigs by Peter Michael and Justin, the popular ventriloquist in South Florida). It was in Florida that Kiko has established critically acclaimed as a mime artist. He also performed at clubs in London, England, Gallaudet University in Washington, D.C., University of North Carolina at Charlotte, state organization convention in Fredericksburg, VA, and numerous places in Pittsburgh and Washington, D.C. metro area. He co-founded the Gold Coast Mime Company in 1982 with Jude Parry, a British mime. Later Gert Pedersen, a mime from Denmark, joined for a few years. Kiko taught mime at the School of Musical Comedy & the Dramatic Arts in Delray Beach, FL, Delray Beach Playhouse, adult education at Nova-Davie Community School in Davie, FL, University Center for the Performing Arts in Plantation, FL, and other places.